An Adjustable Weight Bench is a great tool to work on your fitness at home (or in the gym). Much more versatile and flexible than a standard flat bench, it allows you to carry out more exercises focusing on different areas. Some are available with attachments to increase their versatility, and some models are foldable so they can be stored under a bed or in a closet when they are not being used. 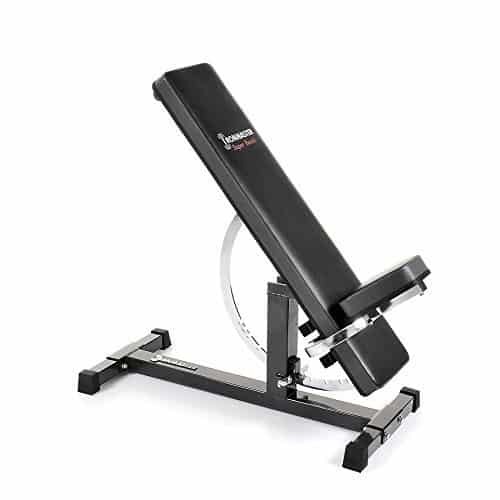 The Fitness Reality 1000 Super Max Weight Bench has a maximum rated weight of 800 pounds. The backrest has 6 easily-adjustable angles, and the front leg has 2 positions, so you can configure this weight bench into a total of 12 different angles. This bench is ideal for dumbbell and other strength training exercises. Unique triangular support structure making this bench the strongest in its price category. Powder coated tubular steel frame construction. This bench arrives partially assembled, it shouldn’t take longer than about 15 minutes to have it ready for use. When set up, it measures 59" L x 23.5" W x 48.5" H and weighs 35lbs. The seat dimensions are 15.3" W x 14.5" L, and the backrest is 10" W x 33.5" L.
Suitable for user heights between 5’0” to 6'4", and weights up to 800lb. 12 position adjustable backrest by utilizing 2 position front leg adjustment. The backrest adjusts between -20 degree decline and +80 degree incline angles. There is a detachable 3 position adjustable leg hold down bar for additional stability during workouts. Extended leg stabilizers prevent movement or rocking during workouts. The Fitness Reality 1000 Super Max Weight Bench can be easily folded for storage. The folded size is 51" L x 23.5" W x 9" H (small & light enough to slide under most beds when not in use). Transportation wheels included for easy relocation. Powder coated tubular steel frame construction. When set up, the bench measures 59" L x 24" W x 48" H and weighs 37lb. The seat dimensions are 15" W x 15" L, and the backrest is 10" W x 34" L.
Suitable for user heights up to 6'4", and weights up to 800lb. 12 position adjustable backrest by utilizing 2 position front leg adjustment. The backrest adjusts from -20 degree decline to +80 degree incline angles. There is a detachable 4 position adjustable leg hold down bar for additional stability during workouts. Extended leg stabilizers prevent movement or rocking during workouts. 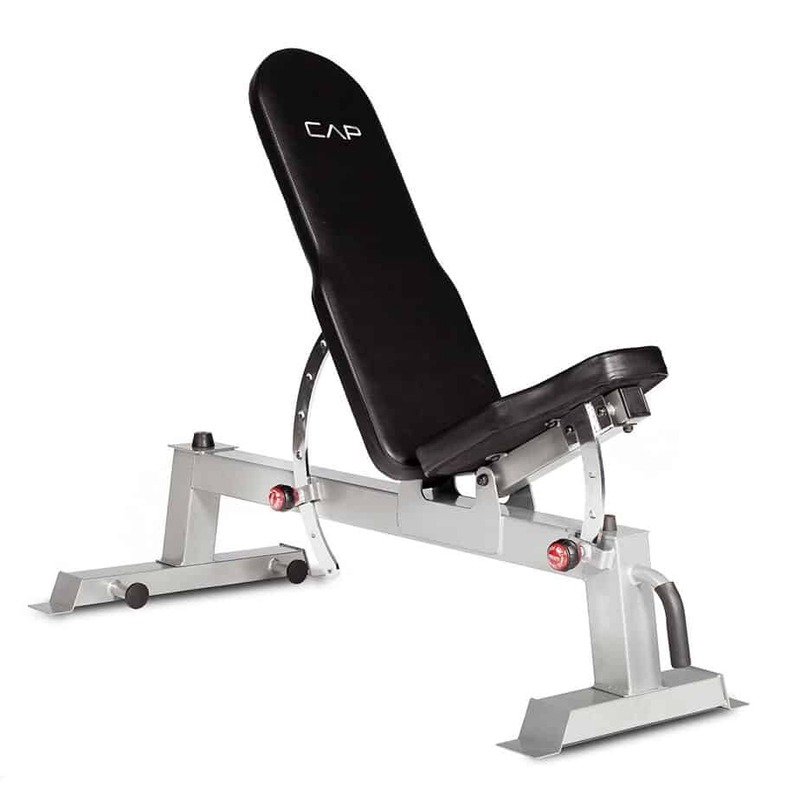 The CAP Barbell Deluxe Utility Weight Bench has a maximum rated weight of 500lb (including user). The backrest has 7 adjustable angles, and the front leg has 3 positions, so you can configure this weight bench into a total of 21 different angles. This bench is ideal for dumbbell, resistance band and other strength training exercises. Three-step powder coated steel construction. Box stitched seating areas with perforated accents. Band / tube anchor posts with safety covers. The manufacturer’s logo is embroidered for comfort. It shouldn’t take longer than about 30 minutes from unboxing to have it ready for use. The assembled size is 53"x27"x45" and weight is 45lbs. The bench can be adjusted to be flat or inclined (no decline adjustment is possible). The adjustment grip pins are oversized for secure adjustments. This bench can be partially folded for storage when not in use. It comes with transport wheels and a handle, to make it easy to maneuver. 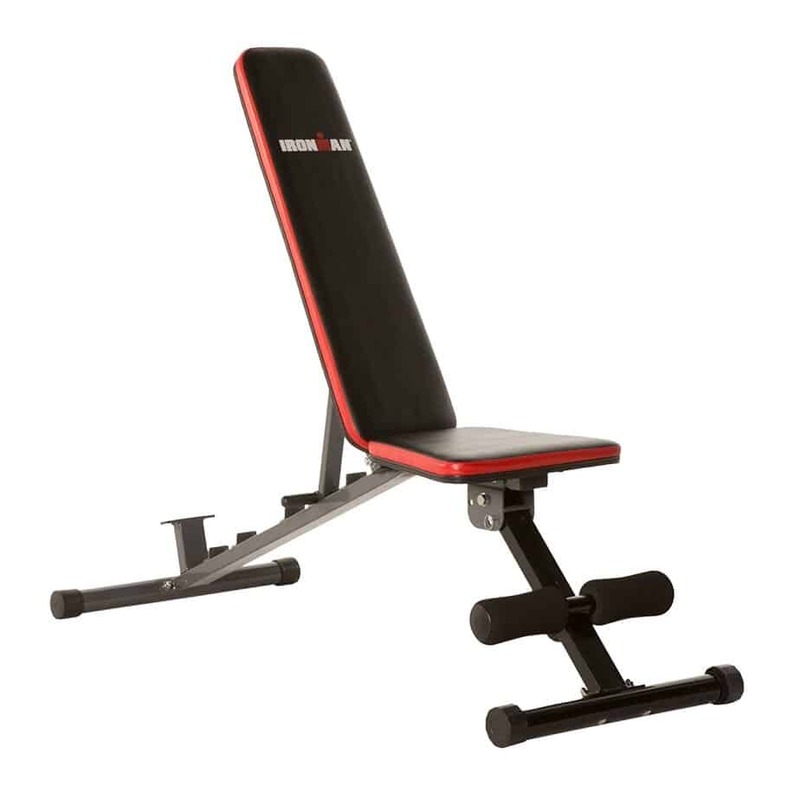 The Rep Fitness Adjustable Bench has a maximum rated weight of 1000 pounds. 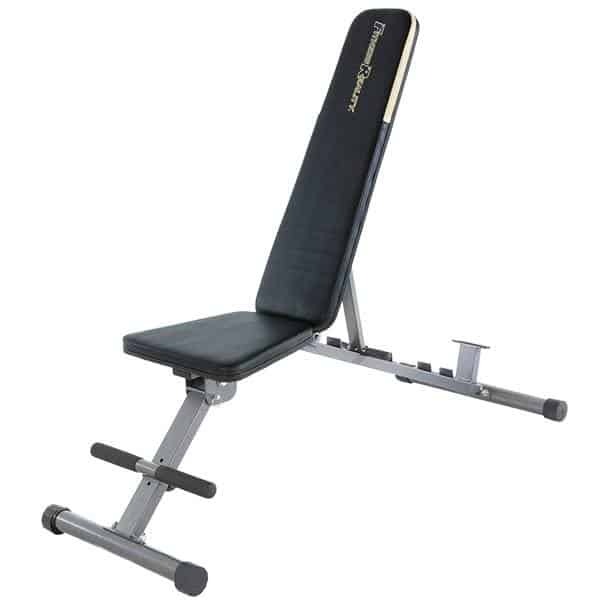 The backrest has 7 positions, and the seat has 4 positions and many angle adjustments, so you can configure this weight bench into a multitude of different positions. This bench is built like a tank, so you can have confidence it’s not going to let you down. Steel frame construction. Bare steel back adjustment ladder to prevent chipping paint. Pads and rollers are covered in easy-clean vinyl. Although the bench arrives partially assembled, it is necessary to tighten all the bolts before use. It shouldn’t take longer than about 15 minutes to have it ready for use. A socket wrench will help with assembly, but is not essential. When set up, it measures 54" x 26" x 17.5" and weighs 85lbs. The pad is 11.5" wide at the shoulders, and is 17.5" from the ground. Suitable for and weights up to 1000lb (including user and weights). 7 position adjustable backrest and 4 position seat height adjustment. The backrest adjusts to -20 degree decline to +85 degree incline angles. There are leg rollers to aid stability during decline exercises. 10-year warranty on frame, 30 days on pads. 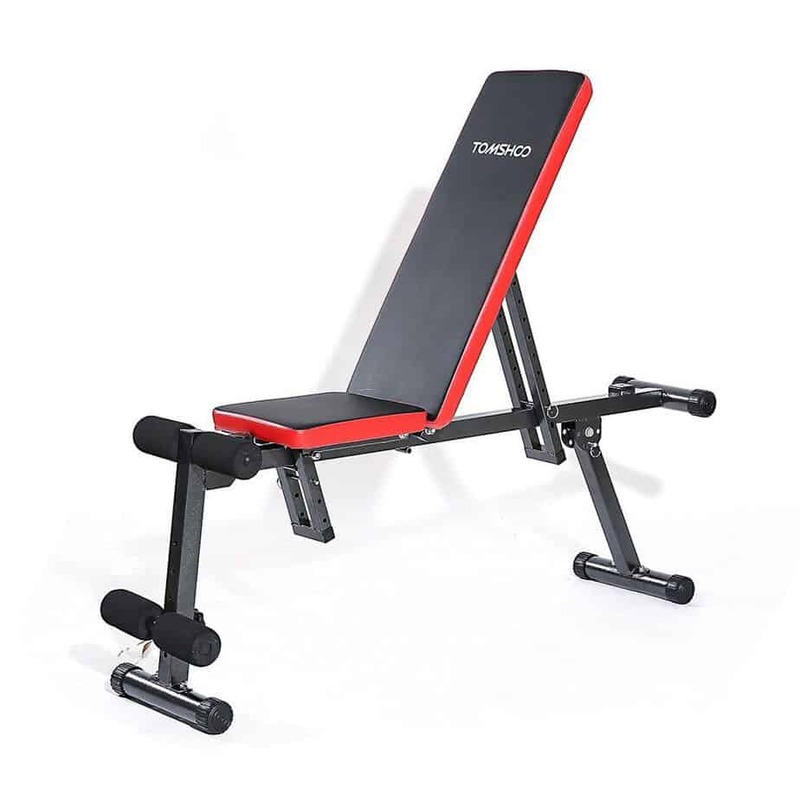 The TOMSHOO Adjustable Folding AB Bench has a maximum rated weight of 440 pounds. It has multiple adjustments, and is very light and compact, easy to fold & store out of the way when you’re not using it. The frame is made of high quality steel, and the backrest and seat are thick foam covered in PU leather. While there is minimal feedback as this is a new product, the manufacturer claims it is fast and easy to assemble. Suitable for weights up to 440lb (including user and weights). 8 level adjustable backrest, 3 level seat cushion height adjustment, and 4 level foam roller height adjustment, giving you a variety of different options. The foam roller assists with ankle and knee positioning when using the bench. The TOMSHOO Adjustable Folding AB Bench can be easily folded for storage. While unlike some of the heavier adjustable weight benches here there are no transportation wheels included, at 24lb this bench is light enough not to need them. 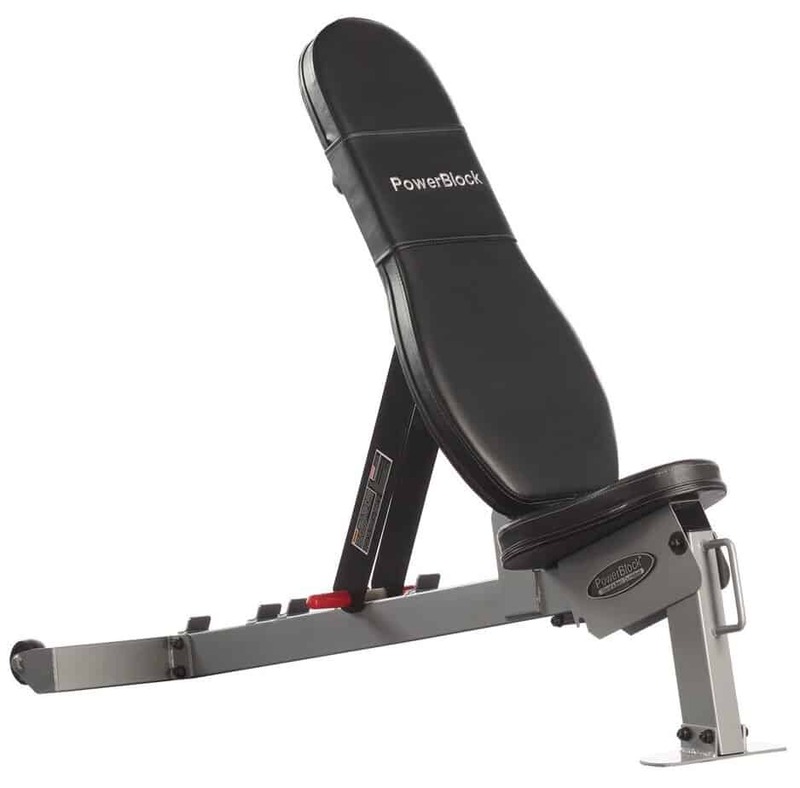 The PowerBlock Sport Bench has a maximum rated weight of 550lb. The backrest has 5 adjustable positions – flat, 30 degree, 45 degree, 60 degree, and military. This bench is ideal for dumbbell and other strength training exercises. 2” x 3” 14-gauge steel tube. This bench arrives mostly assembled, with one user claiming it takes less than 5 minutes to complete the assembly. When set up (flat position), it measures 50" L x 21" W x 16" H and weighs 57lbs. The seat is 12” wide at its widest point, and the backrest varies from 10” to 13” wide. Suitable for weights up to 550lb (user and weights combined). 5 position adjustable backrest. The backrest adjusts between flat and 90 degrees, with 3 pre-defined angles in between. Unlike some others here, the PowerBlock Sport Bench cannot be folded without disassembly. It does come with transport wheels and handle for easy manoeuvring. The Ironmaster Super Bench Adjustable ﻿W﻿eight-﻿L﻿ifting Bench has a maximum rated weight of 1000lbs. You can quickly configure this weight bench into 11 different angles. 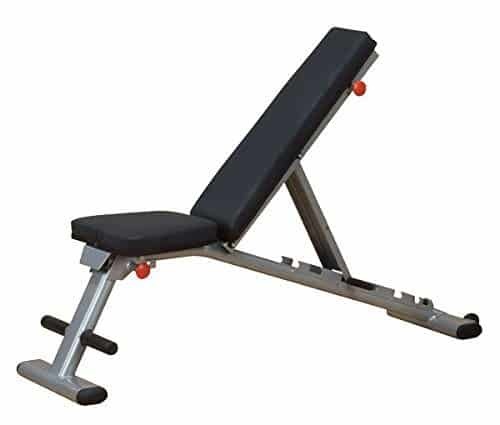 There are many optional attachments available for this bench, depending on what your needs are, such as Crunch Situp, Dip Bar Handles and Chin Up Bar. Powder coated 11/12 gauge steel frame construction. Pads are heavy duty foam covered with stitched vinyl. This bench arrives almost completely assembled, all you are required to do is put the feet on, which should take less than 5 minutes to have it completely ready. When set up, it measures 41" L x 17" W and weighs 60lbs. The pad dimensions are 44" L x 10" W x 3” thick. Suitable for user heights well over 6 feet, (though perhaps a bit high for shorter users), and weights up to 1000lbs. 11 position easily adjustable backrest. The backrest adjusts between 0 degree and 85 degree incline angles (no decline on this bench as supplied, though you can buy a situp attachment to enable this). The seat also has 3 adjustable positions. No transportation wheels are included with this bench, though the manufacturer claims they are not required. 10 year warranty with money back guarantee. The Body Solid GFID225 Folding Adjustable Weight Bench has a maximum rated weight of 800 pounds. The backrest has 7 adjustments, the seat position is fixed, and the manufacturer states it is rated for commercial use, so you would expect it to last in your home gym. Powder coated 2” x 3” steel frame construction. This bench arrives completely assembled. It is 58" long and weighs approx. 60lbs. The seat width varies from 10” to 15”, and the backrest is 7.5” wide at the top, and 9.5” wide at the base. Suitable for users of most sizes up to at least mid 6 feet, and weights up to 800lb. 7 position adjustable backrest. The backrest adjusts between 0 degrees and 85 degree incline angles. 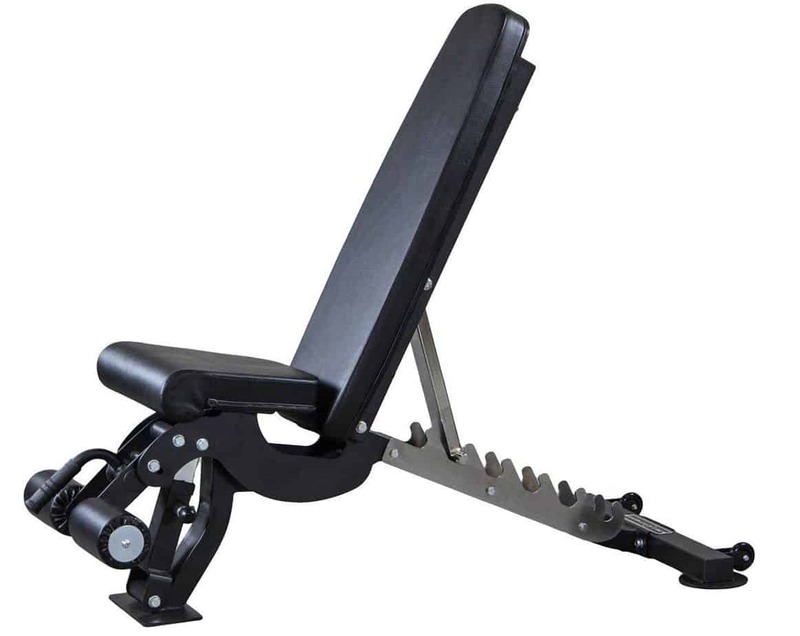 The Body Solid GFID225 Folding Adjustable Weight Bench can be easily folded for storage under a bed or in a closet. The folded size is 55" L x 16" W x 9" H (small & light enough to slide under most beds when not in use). Transportation wheels are included for easy relocation. Lifetime warranty for in-home use.